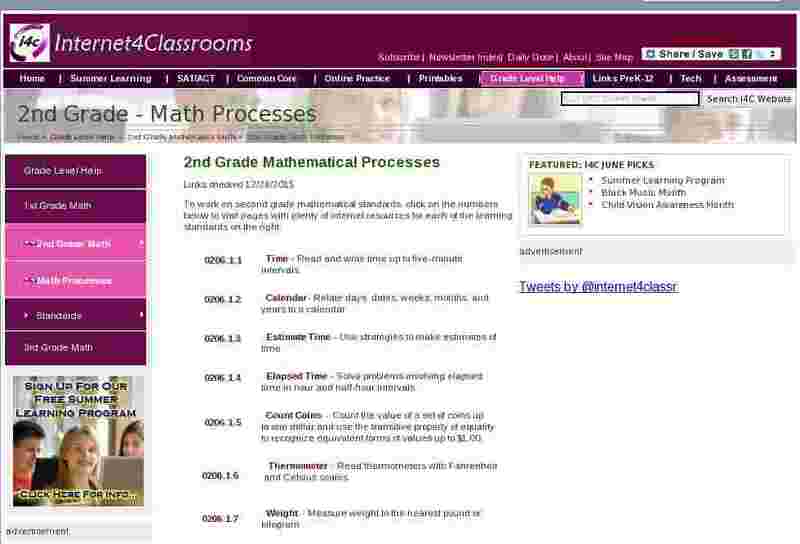 To work on second grade mathematical standards, click on the numbers below to visit pages with plenty of internet resources for each of the learning standards on the right. Time - Read and write time up to five-minute intervals. Calendar- Relate days, dates, weeks, months, and years to a calendar. Estimate Time - Use strategies to make estimates of time. Elapsed Time - Solve problems involving elapsed time in hour and half-hour intervals. Count Coins - Count the value of a set of coins up to one dollar and use the transitive property of equality to recognize equivalent forms of values up to $1.00. Thermometer - Read thermometers with Fahrenheit and Celsius scales. 0206.1.7 Weight - Measure weight to the nearest pound or kilogram. 0206.1.8 Model Fractions - Use concrete models or pictures to show whether a fraction is less than a half, more than a half, or equal to a half. 0206.1.9 Represent Fractions - Match the spoken, written, concrete, and pictorial representations of halves, thirds, and fourths. 0206.1.10 Story Problems - Develop a story problem that illustrates a given addition or subtraction number sentence. 0206.1.11 Manipulatives - Use manipulatives to demonstrate addition and subtraction sentences written symbolically. 0206.1.12 Write Numbers - Write numbers and translate word clues to number sentences and vice versa. 0206.1.13 Transformations - Use manipulatives such as pattern blocks, tangrams, etc. to explore geometric concepts of symmetry and transformations. 0206.1.14 Patterns - Create and observe numerical patterns on a calculator by repeatedly adding or subtracting the same number from some starting number. 0206.1.15 Books, Stories - Use age-appropriate books, stories, and videos to convey ideas of mathematics.